What if you were able to walk into the lobby of your company and get an instant snapshot of what people were saying about your brand across social channels? It'd be worth standing there for five minutes and taking it all in with a cup of coffee, right? 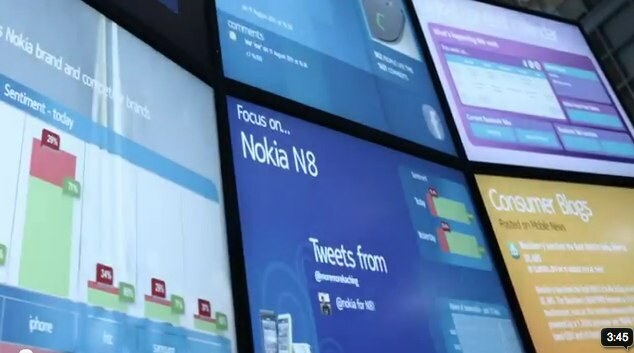 That was Nokia's goal when they created Agora, a six screen social visualizer that brings together all the social conversations, good and bad, about the brand. It's one thing for the people working on a brand's social media to be in touch with this sort of information - and they are...it's their job. But it's another thing - and a much better thing - when everyone in the company has a clear picture of brand sentiment and perception. Having this sort of insight on a daily basis, in our humble opinion, would greatly influence how each employee would approach their job on any given day. If you knew exactly what people were saying about your products, exactly how they use them, insight into the content they create with those products, don't you think that would give you a clearer picture of how to continuously improve your product offering? Nokia does.